Here is English Literature practice set-9 Objective (Multiple Choice Question) MCQ for written exam of UGC NET English Paper-II & III, Assistant Professor/College Cadre Lecturer & TGT/PGT English (KVS/NVS) recruitment exam. 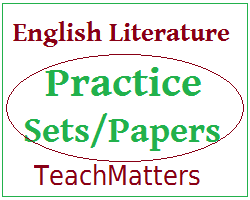 Check practice set of English Literature for competitive exam. 1. Dickens said about one of his novels: “I like this the best”. Which novel was he referring to? 2. Who is the author of Where Angels Fear to Tread? 5. Who was the king in England at the time of Peasants’ Revolt? 6. Which of the following is a prose comedy of Joseph Addison? 9. Who among the following is the pioneer of new criticism? 10. Who for the first time introduced sonnet into English poetry?